Each of the guest rooms are large and bright with lovely views! Visit our local Castle it’s just a few minutes away! When you need a break and only the finest Beaumaris bed and breakfast will do, escape to Cremlyn Farm, our charming farmhouse on the Isle of Anglesey. Cremlyn Farmhouse dates back to 1859 and is the ultimate getaway. It sits on a 460-acre farm which produces beef cattle, sheep, and cereals. The b&b is spacious and full of character. It is just 1.5 miles from the historic town of Beaumaris, which is home to a world-renowned castle, gaol, and courthouse. It is filled with a host of family-friendly attractions which draw countless visitors year in year out. 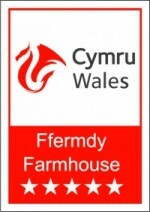 Whether you love working farms, the great outdoors, or simply relaxing on the beach, Cremlyn Farm is a perfect choice! Cremlyn offers relaxing and rejuvenating breaks in the countryside. We will do our very best to ensure you want for nothing during your holiday. We are within a few minutes drive of lovely amenities and attractions like beaches, restaurants, children’s play areas, golf, walks, and fishing. Pay us a visit and you’ll quickly discover that there are no ordinary holidays here, only extraordinary ones. Take the second exit off Britannia Bridge, A5025 Benllech. Keep driving till you pass a roundabout and a garage on the right. When you get to the crossroads, take a right turn and drive through the village of Llansadwrn. Drive till you arrive at a T junction and take a right turn for Beaumaris. Drive downhill and uphill till you see a white cottage on your left. Turn left and drive down the farm road till you get to Cremlyn Farmhouse.